Need custom printed convention badge holders in a hurry? Order our 24 Hour Custom Convention badge holders today and they ship out tomorrow by UPS. There is no upcharge for this rush service. Tempids.com custom printed convention wallets ship the next business day. 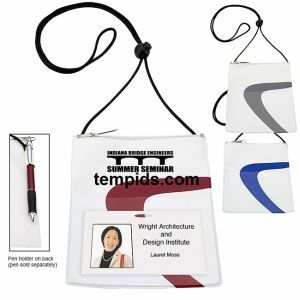 Traditional styled trade show badge holder with all the traditional features: adjustable neck cord, clear pouch for the badge, and pen holder in the back. Pen sold separately of course. Prices start at $4.37 for the low minimum of 150 custom printed pieces. Each holder is two colors with white being the dominant color with blue, red, and gray as the swirl colors. Proofs are not available with this quick production service. Submit vector artwork or we can typeset straight copy. 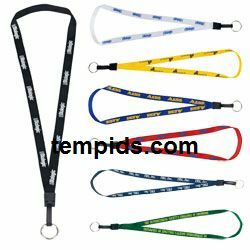 Cutoff time to place 24 hour lanyard order: 4:30 pm eastern. Ordering early is encouraged because there are times when capacity is reached for the day. This means your order would get pushed back one day. Need custom name tags in a hurry? We can print them for you with each attendee or member name on their own badge as shown in sample. Imprint Color Choices: Black, Yellow, Royal Blue, Navy Blue, Purple, Orange, Red, Pink, Burgundy, Kelly Green, Teal, Forest Green, Process Blue, Reflex Blue, Silver, Metallic Gold, Copper, Gray Light, Pink, Maroon, and Dark Gray. If you place your order on a Monday and need it ASAP, you could have it in your hands by Wednesday. If you have a few days to spare and want to avoid the higher UPS shipping rates for accelerated shipping, 35 states in the country will receive their 24 hour custom convention badge holders within 3 days since that is the reach with standard ground service. That is what many of our customers do, take advantage of our rush production without paying rush charges and pay the reasonable UPS ground shipping rates. Our rush service is a true accelerated production. We have done our homework and found others charge additional fees, up to $300.00, to do a rush service of 7 days. We can print that convention badge holder in one day with no rush printing charges. Tempids.com does Convention badge holders the right way. We can also print your attendees name badges for your event in 24 hours or the same day. Please contact us with your questions or order 312.662.2525.